We are a small family business, passionate about the materials we use and how they are used. We use traditional, sustainable, environmentally friendly materials, such as oak, larch and spruce for structural frame work and source stone to match existing areas, all of which are locally sourced. 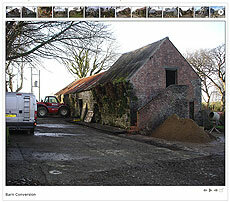 We have a very good understanding of local architecture in West Wales. We use designs to fit in with local architecture and features, often inspired by the natural world using nature’s materials. We undertake garden design and landscape, incorporating patio’s and walled areas. Externally, we interpret plans and ideas to enhance designs to produce structures that not only look good, but fit into their surroundings, making them look like they have been there for years. 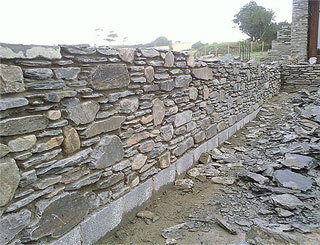 DGB Masonry provides specialist building services and advice for conservation and restoration of stone buildings, from formal ashlar dressed stone on many of our churches and listed buildings to old rubble stone cottages and barns in need of sensitive care and repair to preserve them for our future generations. Where new stone is needed for repairs or new build work, we can usually match stone to type and colour forming very close or exact matching. With an extensive knowledge of local quarries and stock of reclaimed stone and Welsh slate, we will do our best to match the stone to you and your build requirements. We specialise in the sympathetic repair of traditional, heritage and listed buildings in West Wales. The use of lime mortars, render and haired plasters is not only historically correct but essential when repairing an old building in order to maintain its structural integrity. An important part of our business is the work we carry out on churches. These buildings are often amongst the oldest in any town or village and typically demonstrate the best of traditional craftsmanship. Stone and brick work as well as carpentry, plastering and leaded light windows are all evident. Whether the repair of the church tower, masonry or a sympathetic extension using traditional materials, our appreciation and understanding of these buildings makes it all possible. The quality and sensitivity of our work ensures that the churches we work on are looked after for many generations. If you live in a historic property you will no doubt be aware of the special care you have to take looking after it. Finding a builder in whom you can trust can often seem like a minefield. Our team have worked on many buildings of historic importance, as well as numerous homes, both small and large. We can undertake almost any type of work, on almost any scale, whether it is a small repair, or a major renovation or extension project. No matter what, we never compromise on quality, meaning you can rest assured that your building is in good hands. We are always totally honest in our estimates and, unless the unforeseen problem crops up, will work our hardest to honour the estimate we have given.